Jim Joseph, from Phippsburg,ME, was actually on staff a couple years ago for the inaugural June week. That was before we had an actual accordion track, and now he is back as an accordion teacher. Jim plays button accordion in the Quebecois, New England, and Cajun styles and also plays 5 string banjo, mandolin, fiddle, percussion (foot and otherwise) and is a member of several Maine bands including, T-Acadie, Scrod Pudding, and JimmyJo and the Jumbol’ayuhs, with Fiddle Camp staffers Pam Weeks and Bill Olson. 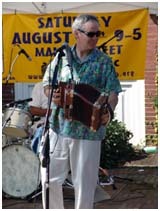 Jim plays single row Cajun accordions (built by Marc Savoy and Junior Martin) and a 2 row Saltarelle D/G box. Here are some videos of Jim in action: A Cajun song with the Jumbol’Ayuhs, and a set of Quebecois reels with T-Acadie.